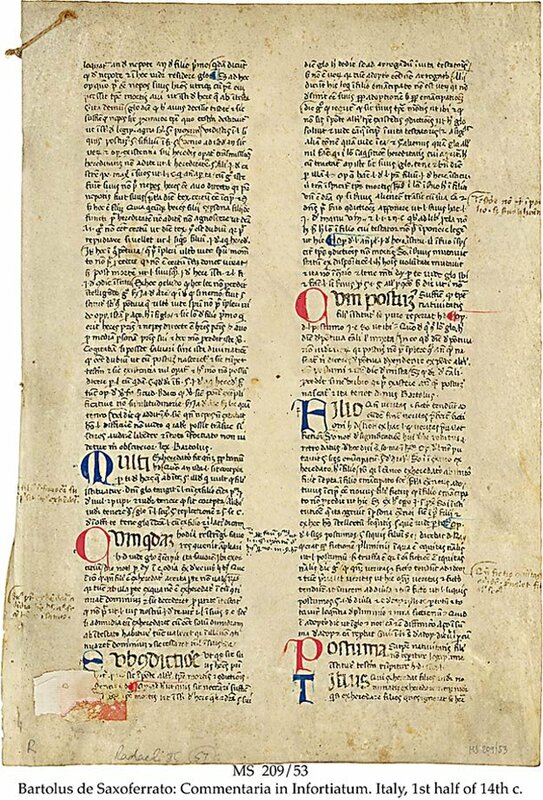 Description	 MS in Latin on vellum, Italy, 1st half of 14th c., 1 f., 32x23 cm, 2 columns, (27x16), 59 lines in Italian cursive book script, 13 2-to 3-line initials in alternate red and blue. Provenance	 1. Francesco Radaeli, Milano (1985); 2. Bernard Rosenthal, San Francisco. Infortiatum is the second of the 3 parts (Digestum vetus, Infortiatum, and Digestum novum) that constitute the Digesta or Pandectae (covering all aspects of civil laws), and which is the main body of Justinian's Corpus Juris Civilis from 529-534, the basics of Western laws up to the present. Corpus Juris Civilis also comprised Codex constitutionum (imperial statutes), Institutionum (manual for jurists, a general survey of Roman law) and the novellae leges (new laws issued from 535-565). 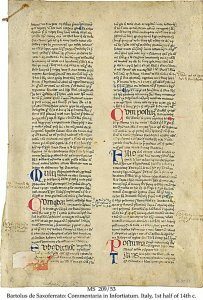 Bartolus de Saxoferrato (1313-1357) is generally recognised as the greatest legal commentator and reformer of the 14th c. and the following centuries.